The death of a loved one is a difficult experience no matter the circumstances. It can be especially difficult when a person dies without a will. If a person dies without a will and there are assets that need to be distributed, the estate will be subject to the process of administration instead of probate proceedings. In this case, the decedent’s heirs can select someone to manage the estate, called an administrator instead of executor. State law will provide who has priority to be appointed as the administrator. Most states’ laws provide that a spouse will have priority and in the event that there is no spouse, the adult children are next in line to serve. However, those that have priority can decline to serve, and the heirs can sign appropriate affidavits or other pleadings to be filed with the court that nominate someone else as the administrator. Once the judge appoints the nominated person they will then have the authority to act and begin estate administration. In certain circumstances, it may be necessary to change the initially appointed administrator during the administration process. Whether this is advisable depends on many factors. First, the initial administrator will have started the process and will be familiar with what remains to be done. The new administrator will likely be behind in many aspects of the case and may have to review what the prior administrator did. This can cause expenses and delays. Also, it is possible that the attorney representing the initial administrator may not be able to ethically represent the new one, again causing increased expenses and delays. However, if the first administrator is not doing his/her job, the heirs can petition to remove the individual and appoint a new one. 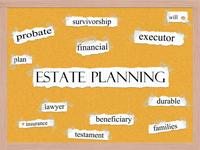 If you are currently involved in a situation where an estate needs to be administered, it is recommended that you speak with an estate planning attorney in your state.